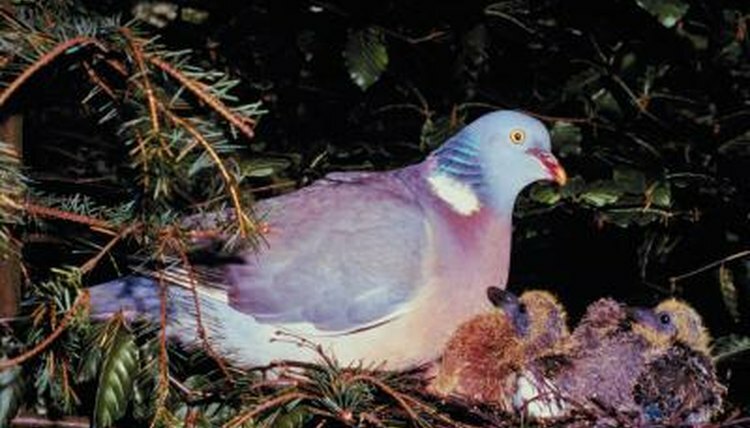 The right nesting box can result in calmer pigeons, easier breeding and in the case of homing pigeons, a faster return. A nesting box is relatively easy to construct and will improve the safety and behavior of your bird. Place one of the boards measuring 30 by 24 inches on a flat work space. This will be the floor board. Squeeze a line of wood glue along the edge of the longest side and press the matching side of the 30-by-12-inch board against the glued edge. Hold the boards together until neither move when released. Use the screw gun to drive five evenly spaced screws into the junction of the two boards. This will create a firmer hold. Repeat the process for the other 30-inch side. Attach one side of one hing to each end of the 24-inch side of the floor board using the screw gun. Use screws to attach the other ends of the hinges to the 24-by-12-inch board. Fasten one half of the latch hardware to the other 24-inch edge on what will be the top edge of the nesting box. Turn the nesting box upside down and evenly space the dowels between the two boards on the remaining 24-inch side. Drive a screw through both the floorboard and each dowel to secure them in place. When you have secured each dowel, turn the box over again. Place the remaining board on top of the box and close the hinged board. Adjust the location of the second half of the latch hardware on top of the last board so that when the hinged door closes, the latch will engage. Use the screw gun to fasten the hardware to this spot. Add a line of wood glue to the top edge of both 30-by-12-inch boards and place the remaining board on top of the box, making sure that all the sides are flush. Allow the glue to dry, then fasten the top board to the sides and dowels with the screw gun, using five screws for each side and one each for the dowels. Fill the completed nesting box with straw and place an nesting bowl in one corner for eggs. You can place the doweled side against the wall and leave the back door open for an open nesting box, or turn it with the dowel side outward for a closed nesting box that still gets airflow. A closed box may be useful at night or to encourage breeding.  A second nesting bowl may help your pigeon keep track of her eggs and avoid using the floor of the nesting box.